Almost all my friends headed back to their classrooms today to get ready for school starting next week. It's a busy time getting classrooms ready, sitting through endless professional development, learning the latest trends, completing data analysis, meeting new teammates, and prepping curriculum. I always found it hard to sit through those meetings when all I wanted to do was be in my classroom prepping for my newest students, so I usually went in a week early. I would spend a week, usually by myself, sifting through the things I shoved in my closet and file cabinet before I left. I'm not one to sort and organize in May or June when I am burnt out and exhausted, so I usually pile and hide and wait until I'm fresh to conquer those messes and see what I really care to keep and reuse. It might take me covering every desk in my classroom with a stack of papers and buying up file folders from office stores like they're going out of business, but I would soon have every paper in a folder in a file in a drawer. Well that, or in a trashcan. Next, I would get to decorating my walls and prepping my bulletin boards. Unfortunately, where I live, the fire marshall is a bit strict and so a lot of the cute things I see on other blogs and on Pinterest boards would never be allowed here. Fabric? No. Rugs? No. Plants? No. Lots of wall coverings? No. You get the idea. In fact I only had one bulletin board, and I used it for my behavior plan, so it wasn't much to look at. I did, however, decorate some of the other walls with character posters or content posters, so I had a little bit more to do than just one bulletin board. But as you can see, I'm not the world's best decorator. One thing I would do before school starting, is to get my system of organization into place. I teach the kids a lot of routines and habits of organization to help them adjust to middle school, but also to help with my sanity. Probably the most helpful system I have used over the years is my use of color to organize and track classes. Every class is assigned a color for the year and I use that color for everything I do with that class. Whether it's writing on the whiteboard, passing out papers, managing their rewards, storing their portfolios, etc. everything I do is in that class color. It's also a technique I recommend to the students when they go to organize their supplies for each class and many who follow my advice come back to thank me for it later. Another area I like to set up is my Reflection Space. This is a little corner out of the way where students can go to take a time-out and think about their behavior when they're having a rough day. It's not much. It's simply a desk and chair, a few character posters to help strike the mood, and a pocket folder with my behavior journals tucked inside. Students simply pull out a behavior journal and complete the questions which ask them to describe their behavior and what better choices could have been made. When they're ready to rejoin the class, they hand it over to me, and we set up a time to call their parents. Finally, my last step in setting up my classroom is to prepare my own little space. I figure that since we spend more waking hours in our classroom than we do at home during the week, that we ought to have a little slice of home while we are away. So I set up a corner, behind my desk, that makes me feel calm and comfy. It helps me when I'm having a rough day, and it helps the kids to connect to me and see that I really am more than just a teacher, that I am a person with a whole life around me. So that is how I set up my classroom to prepare for the year. Of course, don't forget all those papers to go home on the first day. I keep mine on my prep table up front, ready to go. I'm kind of missing it this year, but not enough to go back into the classroom...maybe just enough to offer my assistance to a friend. We'll see. Good luck to those of you headed back. I wish you the best with your students. I know what you do isn't easy, and I commend you for doing it. Did you like this post? Sign up to get other great emails from me, all packed with ideas, resources, tips, notice of giveaways, sales, product information, and more. 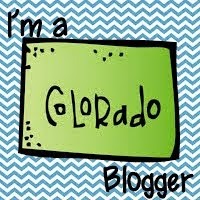 To make sure you get the email, add my email address: brittany@thecoloradoclassroom.com to your address book. © 2017 The Colorado Classroom. Felicity Template designed by Georgia Lou Studios. All rights reserved.